Share the post "Stenocarpus Sinuatus Or Firewheel Tree Is A Popular Ornamental Plant"
The Firewheel Tree is among Australia’s prettiest foliage and flowering native trees. Spectacular flowers are bright red in umbels, in a circular formation, hence the name Firewheel Tree. Each “spoke” in the flower wheel has a swollen yellow tip where the floral organs are. The plant’s scientific name Stenocarpus Sinuatus means from Greek stenos, narrow, and carpos, a fruit, a reference to the characteristics of the seed capsules, and sinuatus from Latin is wavy, a reference to the margins of the leaves. The glossy, deeply lobed leaves, which may be quite variable among trees, make a beautiful backdrop to the fiery crimson flower clusters. There may be a off-putting floral fragrance at night in the effort to attract the moth pollinators. Later, the flowers develop into narrow, leather, boat-shaped fruits that shed numerous winged seeds. Although flowering time is in the warmth of summer and autumn, sporadic blooming may occur at other times of year. Despite its sub-tropical to tropical origin, Stenocarpus sinuatus is adaptable to a range of climates and will even succeed in dry climates if additional water is available. Common names: Firewheel Tree, White Beefwood, Queensland Firewheel Tree, Tulip Flower, White Oak and White Silky Oak. Native: Australia. Rainforests of north-eastern New South Wales and eastern Queensland. Also occurs in Papua New Guinea. Plant type: Trees. Tropicals. Tender Perennials. Evergreen. Soil: Acidic, Neutral, Loam, Sand. Moisture: Average Water. Well Drained. Drought-tolerant. Propagation: From cuttings (will take approx 3-4 years to flower), from seeds (will take approx 7 years to flower). Fertilizer: Avoid applying fertilizers rich in phosphorous or containing high amounts of nitrates. Tips: Mulch during dry weather and fertilize with slow release fertilizer in spring. Protect from wind and frost when young. Older plants survive with foliage dieback. The Firewheel Tree is slow to recover from winter cold damage. Keep in mind that this is a slow growing tree. It is moderately drought tolerant but responds well to irrigation in the heat of summer. This species is also highly sensitive to herbicides. 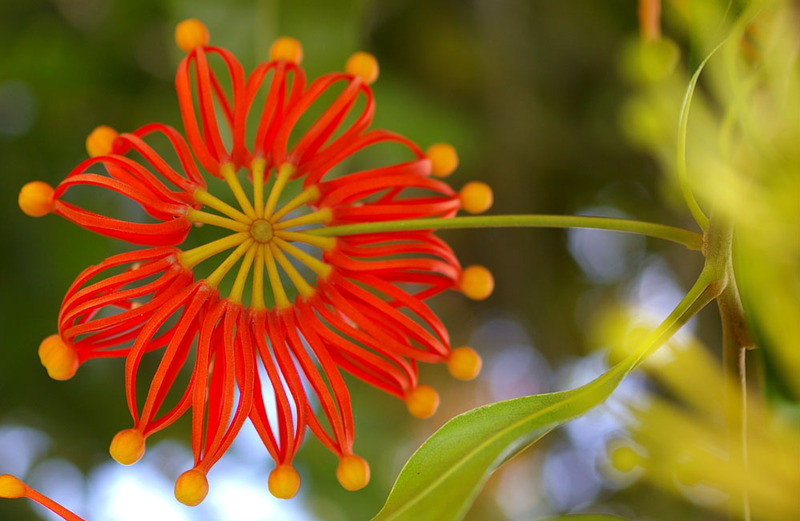 Do you grow Stenocarpus Sinuatus (Firewheel Tree) in your garden? What is your experience with this plant? Please share with other fellow gardeners in the comments below! Do you sell Stenocarpus Sinuatus (Firewheel Tree) seeds or have plants for sale? You can place your advertisement here. Contact us now!